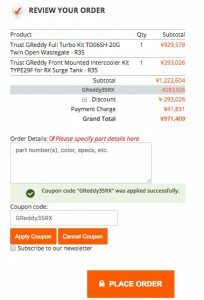 TRUST GReddy R35 Turbine Kit Campaign ~Limited!! Welcome to the RHDJapan blog and thank you for checking this special campaign. This is a MASSIVE Campaign with very limited availability. This campaign will end soon and will be removed as soon as we get word that it has ended. For the very serious R35 owner looking to pickup the TRUST GReddy Turbine Kit the Intercooler Kit can be included as a FREE Service!! Amazing! OVER 30% additional discount! !